Bradley Cooper’s Burnt didn’t bomb nearly as bad as he & Jennifer Lawrence’s dud of a drama Serena, but it also clearly wasn’t a hit. Audiences & critics both spoke very loudly by not saying very much, letting this film slip quietly away when it was released in the heart of Oscar season last year. To add insult to injury, those few who actually did take the time to see it gave the movie mediocre reviews & ratings, calling it haphazard, predictable, and bland. Not the sort of press that makes you run out to the theatres, which is exactly why so many never even heard this film whisper past in late October. But is Burnt as bad as all that, a worthless waste of your time? I say no, but without much conviction. Adam used to be the best. He was young, found himself in Paris, was mentored by the greatest chef in the country, and seemed to be on his way up to great things. But addiction derailed those dreams, perfectionism led to the inability to cope with everyday existence, and Adam burned out. After a self-prescribed penance doing menial line cook work, Adam is ready to get back in the game. He heads to London, gathers together the old crew, and forces his foot in the door of a failing restaurant. Can Adam work his magic over the menu and turn this place & this team into a Michelin star caliber establishment, or will his ego push those he loves away for good this time, leaving him all alone in the kitchen? Burnt is definitely predictable and fairly mediocre, but that doesn’t stop it from being watchable as well. Did you see Chef? 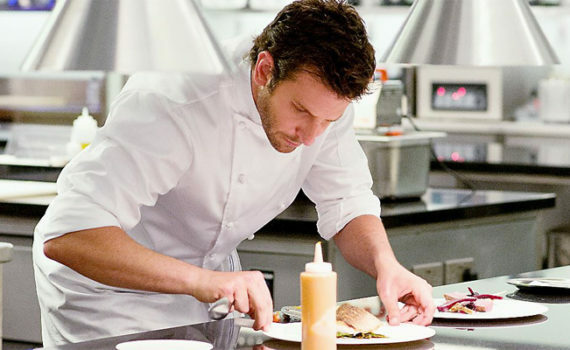 Burnt is Chef but with fine dining, a little more drama, and a little less likeability. It showcases the love of food, the crazy people who make their lives about food, and how not being able to perfect food can drive you mad. The problem is that none of us are rock star chefs and the very concept is a bit laughable to your average Joe; it was always going to be hard for us to love this film since we can’t really relate. Add in a ton of over-dramatic dialogue & some over-exaggerated cinematography and you’ve got yourself a bit of a mess. Good acting saved the day though, with a solid performance from Cooper, the best I’ve ever seen from Miller, and a great role by an up-and-coming Bruhl. Also, there’s a whole crop of cameos that I enjoyed even if they were slightly pointless: Emma Thompson, Uma Thurman, Alicia Vikander. Burnt is nothing close to perfect, but if you sit back with a plate of good food on your lap expecting a fine film that should entertain over the course of 90 minutes, you just might find it.